Game Of Thrones Season 8: Jonas Brothers or Sophie Turner, Priyanka Chopra and Daniella Jonas' J Sisters - Who Look Better on the Iron Throne? The first episode the Game of Thrones finale finally premiered today and after a two-year long wait, it all seems surreal. Fans have been at it since morning, from discussing the new episode to talking about their favorite characters. Well, coming to favorite characters, Sophie Turner's Sansa Stark has a massive fan following and it was great to see how her fiance, Joe Jonas' band Jonas Brothers showed their support by posting a picture of the trio, Joe, Kevin and Nick sitting on the Iron throne this morning. 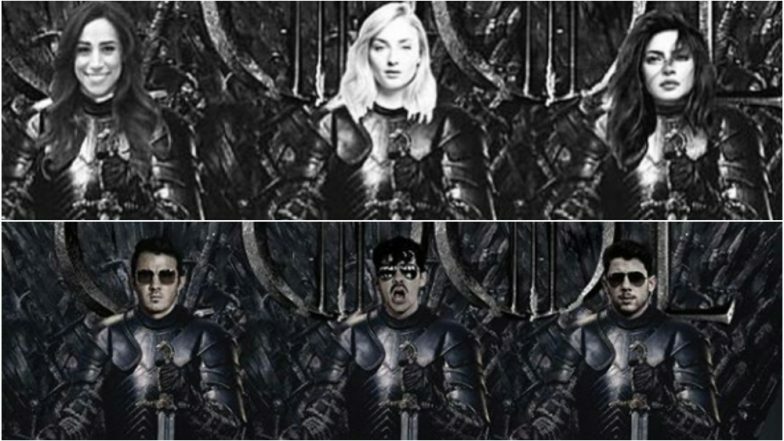 With the whole family coming together in their recent music video, Sucker, fans immediately put together a new picture of the J Sisters, which includes Sophie Turner as well as Nick Jonas' wife Priyanka Chopra and Kevin Jonas' wife Daniella Jonas all sitting on the Iron Throne. Well, we have to say it has been a tough call choosing between the Jonas Brothers vs the J Sisters. Game of Thrones Season 8 Episode 2 Promo: Sansa Stark and Daenerys Targaryen Are Never Trusting Cersei Lannister Again – Watch Video. Sharing the picture on their Instagram account, the Jonas Brothers wrote, "Had to do it 😎🤷🏻‍♂️🆒 Winter is upon us. "The trio is seen sitting on the Iron throne sporting shades and we bet they look 'cool', just like their new track. The fan-made picture of the J Sisters sitting on the Iron throne was equally impressive. While many would love to see Sophie Turner's Sansa Stark actually take the throne, seeing the global icon Priyanka Chopra alongside her certainly made Indian fans of the show talking about how amazing PC would be in the show. [SPOILER] Game of Thrones 8 Premiere: Sansa Stark-Tyrion Lannister, Jon Snow-Arya, Bran-Jaime - 5 Reunions that Steal the Show. Sophie Turner's Sansa Stark surely made an impressive entry into the final season's first episode. We love how the Lady of Winterfell is giving cold vibes to the Mother of Dragons, Daenerys Targaryen and holding her own amidst all this. The second episode of Game of Thrones Season 8 is all set to air on April 21.